The artists humor and attitude are reflected in both her lyrics and her interpretations. Also evident here is her passion for finding choice material by other writers including Pulitzer Prize-winning playwright Lanford Wilson, actor Jonathan Hogan, Michael and Kevin Bacon (aka: The Bacon Brothers) and such terrific New York songwriters as Jane Barnett, Margaret Dorn and Martee LeBow. 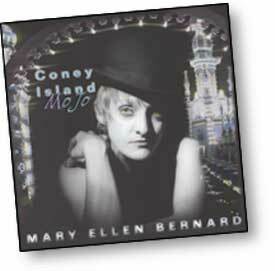 From the haunting title track, written and arranged by Bernards husband and producer Paul Guzzone, to the hilarious The Diaper Rag (the couples answer to the propagation of the Baby Boomers), Coney Island Mojo has been winning the hearts of fans, reviewers and radio personalities.